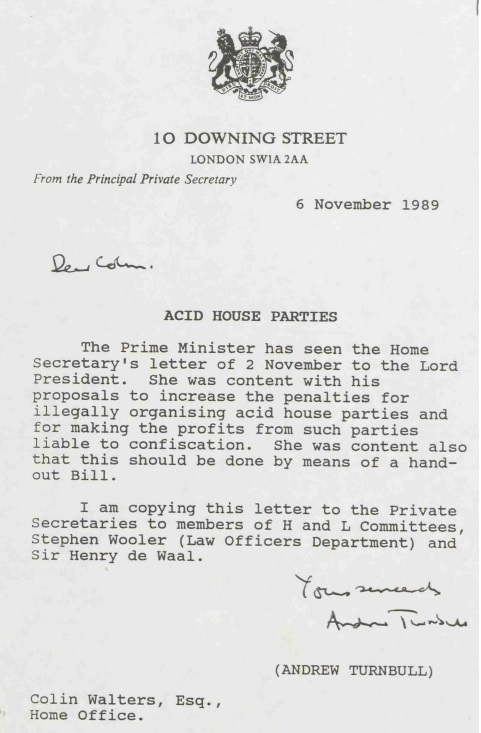 The National Archives has today released Prime Minister’s Office and Cabinet files from 1989 and 1990, including discussions amongst Ministers and officials of how to clamp down on 'Acid House' parties. A letter from the Home Secretary to Geoffrey Howe from 2 November 1989 reported: 'We understand from the Metropolitan Police that so far this year 223 such parties have taken place in London and the South East, of which 96 were actually stopped after they had begun. A further 95 planned parties have been prevented by pre-emptive action by the police or local authorities' (letter 2 November 1989). 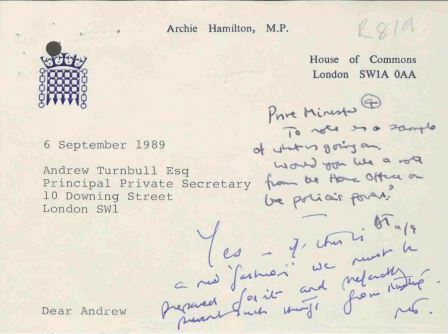 In a hand written comment, Prime Minister Thatcher wrote ‘if this is a new “fashion” we must be prepared for it and preferably prevent such things from lasting’ (6 September 1989). After reviewing the powers available to the authorities, the Government concluded that the way forward was to increase the fines for existing licensing offences, rather than bring in new powers as such. 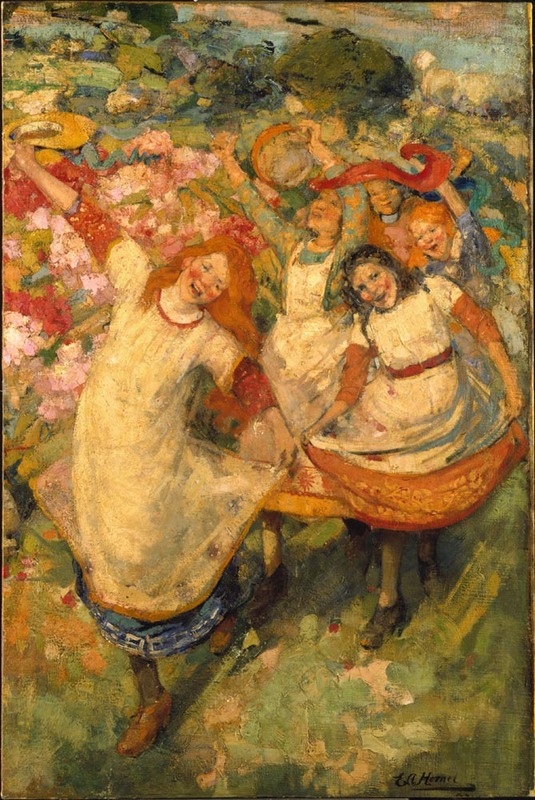 The result was to be the Entertainments (Increased Penalties) Act 1990 - 'An Act to increase the penalties for certain offences under enactments relating to the licensing of premises or places used for dancing, music or other entertainments of a like kind'. The question was of course to be revisited a few years later when the Government introduced the Criminal Justice Act which gave the police more direct powers to intervene to stop parties. In the mean time, the police and local authorities were encouraged to make more assertive use of existing powers. The papers include a press clipping praising Operation Jute, a massive police operation to stop a party in Kent: 'Drug busting police sealed off an entire town twice at the weekend to claim thier first victory over the Acid House cult. Six thousand revellers were turned back from Chatham, Kent in the early hours of yesterday after a specially trained squad of 250 officers outmanoeuvred them across three counties' (Daily Express, 9 October 1989). 'It was the last of the community clubbing experiences. 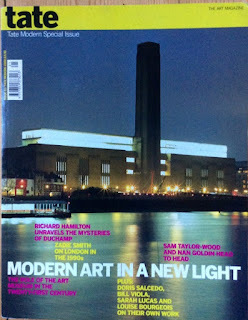 It was artificial because it was partly to do with fame. You'd have a lot of people in there pretending that they couldn't see Bjork, who was standing right next to them. Yet the whole of the club was in one corner of the room circled around Bjork. It was about fame, but it was these people who did have quite a huge amount of fame who seemed perfectly willing to hang out with you, smoke with you, have a drink. Everybody was having a laugh. It is now more than 30 years since the 1984-85 miners strike, the last great stand of what had once been seen as the most militant and powerful section of the working class in Britain. The dispute started in South Yorkshire in March 1984 with miners walking out in response to the announcement that Cortonwood pit was threatened with closure. The miners claimed that there was a Government and coal board plan to close down large parts of the industry, and the National Union of Mineworkers called a national strike. The strike finished a year later in defeat. The miners’ claims that the industry was under threat were soon proved correct – the last deep mine in the UK closed last December. The full forces of the state were mobilised against the strike. New laws were passed, more than 11,000 arrests were made and almost 200 miners were imprisoned. On the other side there was significant support for the strike, with miners support groups being set up across the country. On the music front there were many benefit gigs involving a wide spectrum from folk singers to punk bands, and as the strike progressed songs were written about it and records released. 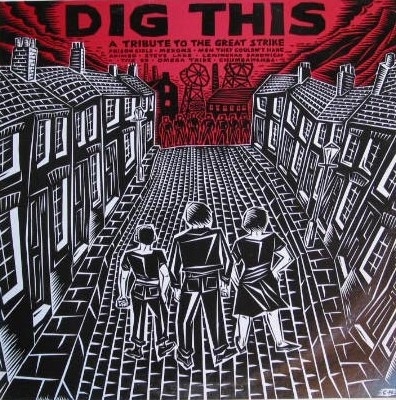 What follows is a mix I have put together of music related to the miners strike. It includes songs and tracks about the strike, mostly from the time of the dispute but in some cases looking back in its aftermath. The mix also includes some spoken word recollections from the strike, including my own of one particular day in Mansfield. 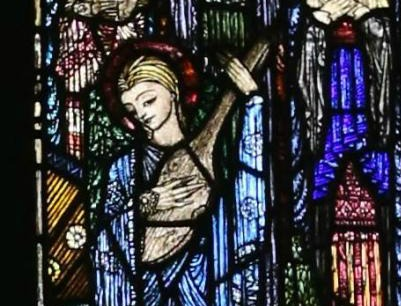 It reflects the diversity of the musical output related to the strike, so does leap from industrial noise to acoustic ballads – and in some cases mixes the two together. The collision of Norma Waterson and Test Dept sounds great! From BBC Radio Ballads: The Ballad of The Miner's Strike (2010), including miners recalling the Orgreave picket. 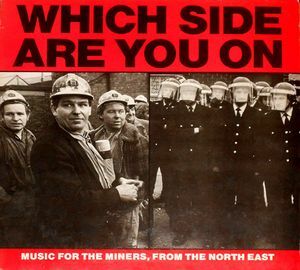 Song written by Kay Sutcliffe and originally recorded by Eve Bland for the album 'Which Side Are You On: Music For The Miners From The North East' (1985). 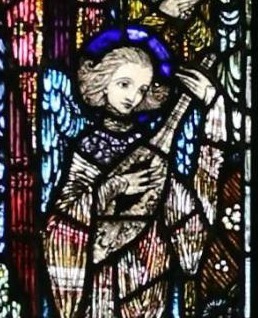 The song has also been recorded by artists including The Happy End (1987), Chumbawamba (1992), The Oyster Band and Norma Waterson. 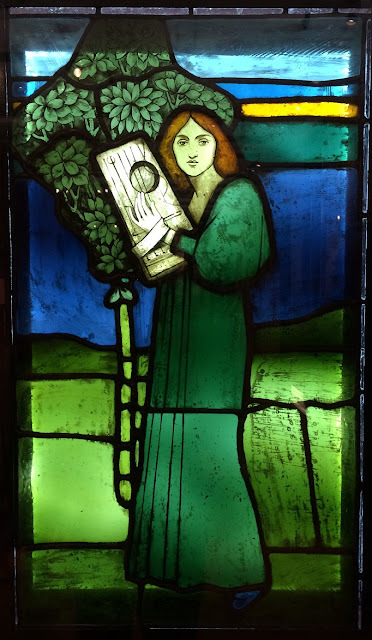 The song’s popularity perhaps relates to its melancholy anticipation of the actual outcome of the strike – not a heroic victory but the desolation of closed mines and industrial ruins. Sutcliffe asked ‘What will become of this pit-yard, Where men once trampled faces hard?’, imagining a future of ‘tourists gazing round. Asking if men once worked here, Way beneath this pit-head gear’. Now all the pits have closed all that remains is the National Coal Mining Museum. 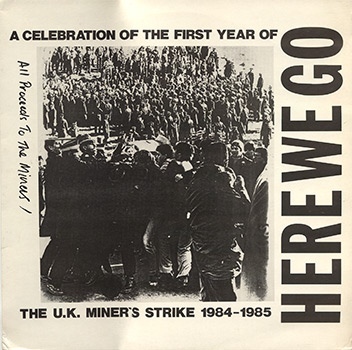 From the compilation album Here we go: A celebration of the first year of the U.K Miner's Strike 1984-1985 (Sterile Records 1985), featuring bands associated with the industrial scene. Paul Weller and Mick Talbot’s Style Council with guests including Motown singer Jimmy Ruffin, Dee C. Lee, Junior Giscombe, Dizzy Hites and Vaughan Toulouse: 'Getcha mining soul deep with a lesson in history, There's people fighting for their communities, Don't say their struggle does not involve you, If you're from the working class it's your struggle too'. Spoken word reflection on women joining the picket line by one of the founders of Women Against Pit Closures. 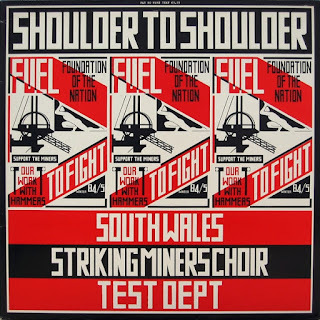 Excerpts from speech by Kent miner, taken from the album Shoulder to Shoulder by Test Dept and South Wales Striking Miners Choir (1985). 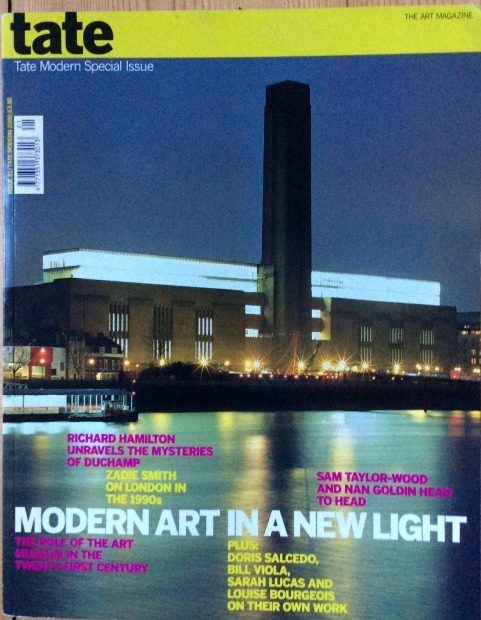 Last April (2015) I went to a great Test Dept film/book launch at the Ritzy Cinema in Brixton. Alan Sutcliffe was there in the audience and said a few words. This track was included on the compilation album Here we go: A celebration of the first year of the U.K. Miner's Strike 1984-1985 (Sterile Records 1985). This version is from the 1985 album 'Songs of Love and Revolution'. From the compilation album ‘Dig This: A Tribute To The Great Strike’ (Forward Sounds International, 1985). 'Smiles for the cameras as the miners return, They say no one has lost and no one has gained, But wiser and stronger the people have changed, And it won't be the same in Fitzwilliam again'. From the album ‘Which side are you on ?’ (Which Side Records, 1985) – song written by Ewan MacColl, his version was included on a cassette he and Peggy Seeger put out in 1984. 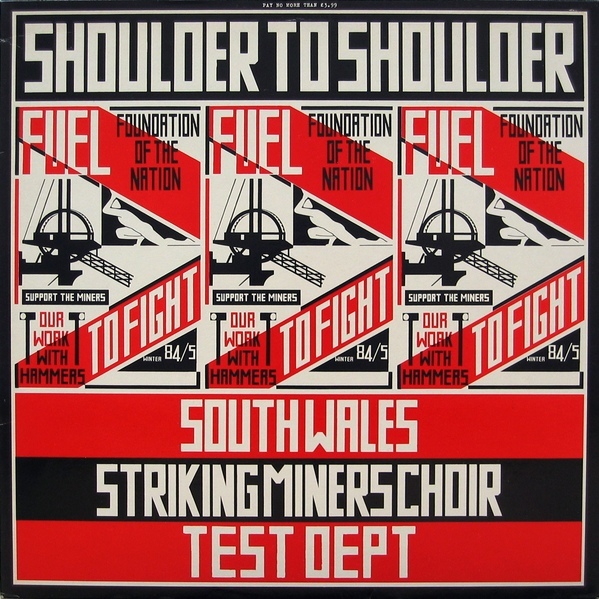 ‘Daddy what did you do in the strike’ on their Blackthorn records was 'a musical documentation of the 1984 miners strike' with 'profits to National Union of Mineworkers'. An internationalist response linking the miners strike with other struggles across the world at that time: 'For liberty there is a cost, it's broken skull and leather cosh, from the boys in uniform, now you know what side they're on... 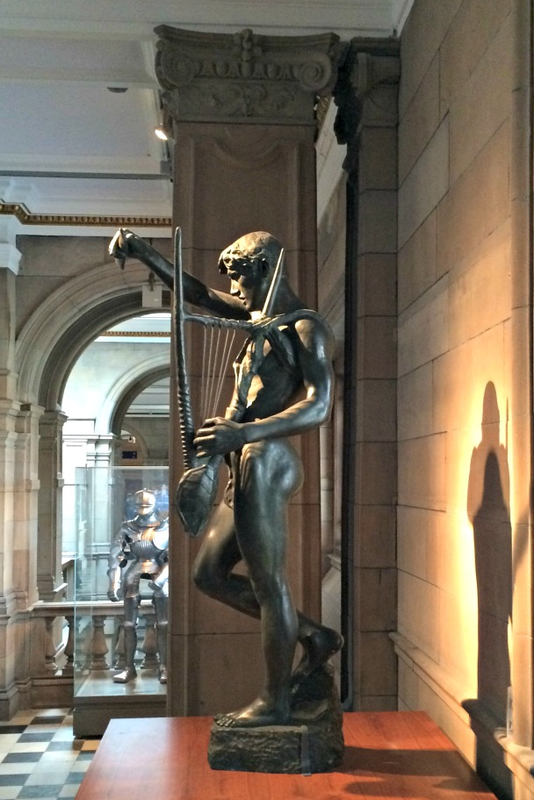 In Chile, In Poland, Johannesburg, South Yorkshire, A stone's throw away, now we're there'.